RealtyJuggler is a customer relationship management (CRM) platform for managing real estate leads and other related activities. The software integrates with a variety of third-party apps to create an all-around lead management and nurturing tool. RealtyJuggler costs $99 per year and is good for solo agents or small teams. If you don’t have room in your budget for RealtyJuggler, check out Freshsales, which is a highly customizable general CRM that offers a free package as well as paid options going up to $79 per user, per month. Even though Freshsales isn’t real estate-specific, the software allows you to do many of the same things as RealtyJuggler and other real estate-oriented CRMs. RealtyJuggler helps agents organize and manage real estate leads using software that’s accessible from your computer, cell phone or tablet. The platform tracks lead contact information and helps you nurture prospects through a number of third-party app integrations. You can then link your account with apps like Zillow, Mailchimp, and Canva to generate and manage leads from one place. Real estate agents can benefit from using RealtyJuggler’s CRM tools because the platform is specifically designed to help real estate agents and brokers manage web leads. For example, use RealtyJuggler’s Zillow integration to feed Zillow Premier Agent leads straight to your CRM. The platform also features a closings function and integration with StreamLine to help you organize your transactions and real-time goals reporting to keep you and your agents on track. Beyond CRM capabilities, RealtyJuggler lets agents create email marketing campaigns through Mailchimp and a variety of email templates provided by RealtyJuggler. Agents can also use RealtyJuggler’s predesigned flyers and third-party apps like Canva and Snap Flyers to create brochures and other promotional materials. Plus, you can attract even more visitors to your open houses using integrations with Signarama and TourFactory. RealtyJuggler is best for new agents or those just starting to use a CRM because it’s user-friendly and affordable for solo agents. The interface is more outdated than other CRMs, but the variety of third-party app integrations make it highly customizable. Plus, RealtyJuggler’s free 90-day trial and low cost make it a great value. RealtyJuggler costs $99 per user, per year, making it less expensive than many other real estate-specific CRMs. The platform’s lead management tools are limited to basic contact management and transaction tracking and are less robust than other platforms. However, RealtyJuggler is a superb value for solo agents just starting to use a CRM. The RealtyJuggler platform includes CRM services like prospect management tools and transaction tracking. Although the platform has a somewhat clunky interface, it integrates with apps like Mailchimp and Zapier. For that reason, it still offers users a great way to customize your lead generation and marketing software while minimizing costs. RealtyJuggler’s CRM offers basic contact and lead management tools to help agents send and track communications, set appointments, create mailing labels and manage other promotional and administrative tasks. In contrast to other CRM options, RealtyJuggler makes it somewhat difficult to rank and categorize leads based on their strength and track them within the sales funnel. However, the CRM dashboard is fine for small teams that don’t need extensive functionality. RealtyJuggler lets you sync with a variety of lead generation tools like Zillow, Trulia, BoldLeads, HomeValueLeads, TheRedX and Landvoice to grow prospects and build your business. However, linking the platform with common internet data exchange (IDX) websites like Real Geeks can be a laborious process because it is a partner rather than a fully integrated lead generation tool. So, if you plan to generate leads through an IDX-enabled website, RealtyJuggler may not be your best option. RealtyJuggler lets agents track tasks and closings so they can keep track of all of their listings. The platform lets you manage transactions with a general task list for things like financing, closing dates and more. Plus, RealtyJuggler’s closings function helps users track closing information like contingencies, earnest money, commissions and appointments. Screenshot of RealtyJuggler transaction management tool. RealtyJuggler gives agents the ability to integrate with several automated telephone dialer and short message service (SMS) texting platforms, such as Twilio, RoboTalker, EXtexting and Slybroadcast. However, Mojo Dialer — a popular real estate dialer — is not currently available as a direct integration with RealtyJuggler. In addition, our review of the software revealed that integration with the SMS and call capture apps is less streamlined than with other real estate CRMs. RealtyJuggler simplifies real estate marketing by providing a variety of marketing tools, including integrations that help you create promotional materials like newsletters, letters, and flyers. Specifically, RealtyJuggler includes Comparative Marketing Analysis through CloudCMA and the RealtyTools ToolKitCMA. This helps agents create visually appealing and informative local market reports to share relevant listings, comps and other relevant neighborhood information with clients. RealtyJuggler lets users track the progress of their leads using the built-in Goals feature. Goals include a referral map, client touches, income, expenses and more so you and your agents know where you stand with each client and transaction. Keep in mind, however, that this reporting feature isn’t as robust as in other real estate CRMs, so if reporting and analytics are important to you, consider another platform. In addition to standard CRM tools, RealtyJuggler features tools and integrations that help agents nurture prospects and convert leads into sales. For example, the platform is integrated with a variety of apps that can simplify your open houses. Integration with Signarama can help agents create yard signs for listings and open houses and TourFactory helps you create virtual tours and home photos to enhance marketing materials. Screenshot of RealtyJuggler user dashboard. RealtyJuggler offers a free 90-day trial and an affordable paid plan for just $99 per user, per year. However, if you’re a solo agent or small team and don’t want to commit to a paid CRM with features or integrations you may not use, considering trying out the free Freshsales Sprout plan. Freshsales isn’t real estate-specific like RealtyJuggler but can be customized to meet all of the needs of a solo agent or small team. The bulk of RealtyJuggler’s power lies in the numerous third-party app integrations. The platform offers basic CRMs but helps you maximize lead generation with lead capture forms, email follow-up, Facebook advertising, and more. Plus, RealtyJuggler provides agents with ample online tutorials and customer support resources to help you make the most of the platform. RealtyJuggler’s functionality is largely dependent on a robust offering of third-party apps for integration. Therefore, to optimize your existing leads, first sync with your Google and Outlook contacts and lead generation platforms like Zillow, BoldLeads and TheRedX. Then, take advantage of Facebook advertising through Zapier and IDX integrations to grow your network of prospects. To import existing contacts from Outlook, go to the main menu and select “Settings,” choose “Contacts” from the “Import” pull-down menu and click “Outlook comma-separated values (CSV)” from the “Format” menu. Then, select the contact file you want to import and click on the “Import” button. RealtyJuggler lets you capture leads directly through websites like Zillow and BoldLeads using eMailFeed, which takes each of your emails and converts it into a contact. In addition, you can integrate RealtyJuggler with the contact forms on your website, blog or IDX-enabled platform. Finally, direct leads from your business’s Facebook ads using Zapier or through one of RealtyJuggler’s ad partners like LeadsBridge. To keep your leads engaged and attract new prospects to your listings, take advantage of RealtyJuggler’s video integrations. First, use TourFactory to create virtual tours of your properties using listing photos. TourFactory’s professional photography services include everything from floor plans and basic interior photos to aerial images and eye-catching videos that directly integrate with your RealtyJuggler email marketing tools. RealtyJuggler syncs with MailChimp to send personalized content to leads and connects with Keeping Current Matters (KCM) for a steady stream of new content. For even more email ideas, you can use RealtyJuggler’s 500 letters, drip sequences, and eCards that come with the platform. Finally, if you’re not comfortable with automated campaigns, hire a virtual assistant through StreamLine or RealSupport to help you strategically follow-up with prospects. Unlike some CRMs that have a built-in dialer, RealtyJuggler requires you to integrate with a third-party app. However, because of this, you can choose between one of several platforms including Twilio, RoboTalker, EZtexting and Slybroadcast. In addition to scheduling bulk SMS messages to your leads, you can use RealtyJuggler’s tools to send ringless mass voicemails with personalized messages. Make the most out of your CRM by using RealtyJuggler to attract more attention to your open houses. In addition to creating exciting email content with TourFactory, use the platform to create virtual tours that you can share with out-of-town leads who can’t make it to your showing. Plus, ensure that local contacts can find your open houses by linking with Signarama to create yard signs that will draw in potential buyers. In addition to creating signage for your next open house, use RealtyJuggler’s integrations to create custom brochures and flyers. RealtyJuggler comes with 101 predesigned flyers, plus you can connect with Snap Flyers and Canva to create custom materials for your agents or specific listings. In addition to flyers, Canva can help you create multi-page brochures, signs, and infographics, using their templates and drag-and-drop design tools. RealtyJuggler offers robust video tutorials to help agents make the most of the platform’s CRM and marketing tools. Users can access a variety of YouTube video tutorials through the user dashboard and take advantage of Darci Talks, which provides training on how to manage leads using RealtyJuggler. Some of the platform’s features are not as intuitive as other CRMs, but each portion of the software includes a link to the relevant video tutorial making it easy to learn — even for those who aren’t tech-savvy. What’s more, RealtyJuggler provides agents customer support via telephone and email so you’ll have easy access to the resources you need to grow your network. 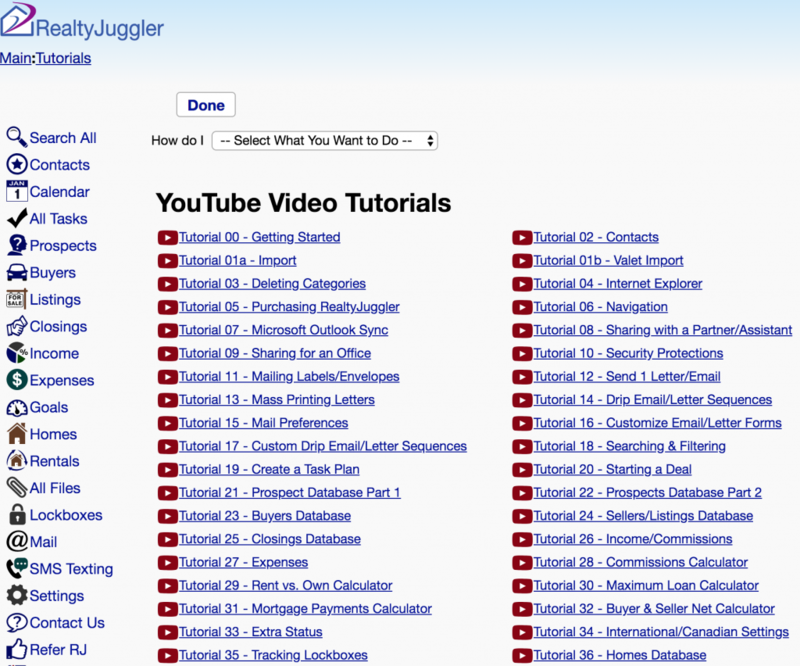 Screenshot of RealtyJuggler video tutorials. RealtyJuggler reviews are mostly positive, with users citing its affordability, ease of use and ample online resources. However, many agents report that RealtyJuggler’s user dashboard is outdated, cumbersome and lacks a robust transaction manager. If you’re trying to choose a CRM, check out our RealtyJuggler review page for more reviews from actual users. If you’re in the market for a real estate CRM but want more built-in tools, you may also consider alternative general use CRMs like Freshsales, Pipedrive, or Zoho. While these alternative options may not include real estate specific integrations, they are often more user-friendly, customizable, and affordable compared to the industry-specific options. RealtyJuggler is a great option for many agents but may be beyond your budget for small teams and solo agents just starting out. Freshsales is a great alternative because it offers a wide range of packages, starting at the Forever Free version and going up to $79 per user, per month with a great mobile app and built-in dialer. Plus, Freshsales offers a free 30-day trial so you can try it risk-free if you want to venture into CRMs without breaking the bank. Pipedrive is a general purpose, cloud-based CRM software that simplifies the sales process and helps sales teams manage relationship building and nurturing with its focus on organizing leads in a highly visual pipeline. The platform is highly intuitive and user-friendly and also offers helpful built-in tools like Pipedrive eSignatures. Pipedrive starts at just $15 per user, per month, so it’s an affordable option for agents who want a general CRM. Zoho is a general CRM software that helps small businesses manage their contacts and automate their email marketing and lead generation tasks and also works with third-party tools like LeadSites. The cost of the platform ranges from free for three users to $20 per user, per month, making it an excellent option for solo agents and small teams. Users find that the platform is comprehensive, customizable and an excellent value. RealtyJuggler is a real estate-specific CRM with standard lead management features, plus lead nurturing, email marketing and transaction management tools. The platform integrates with a variety of third-party apps and is just $99 per user, per year. It’s a great option for solo agents or small teams who need a basic, customizable CRM for a low annual price. Is There a RealtyJuggler Demo? RealtyJuggler offers a free 90-day trial period so you can decide whether you want to use the software for your real estate business. The trial is fully functional and lets you explore the platform without providing payment information. Once you complete the trial period, you can decide if you want to join for $99 per user, per month. A real estate CRM helps agents import all of the leads they generate through different platforms and organize them in one place. Standard CRM platforms include features like lead assignment, follow-up tracking and integrated or built-in email marketing, dialers and more. Is There a RealtyJuggler App? There is not a RealtyJuggler app. However, the RealtyJuggler platform syncs with both iOS and Android phones so that you can connect your email, contacts and calendar to the CRM. 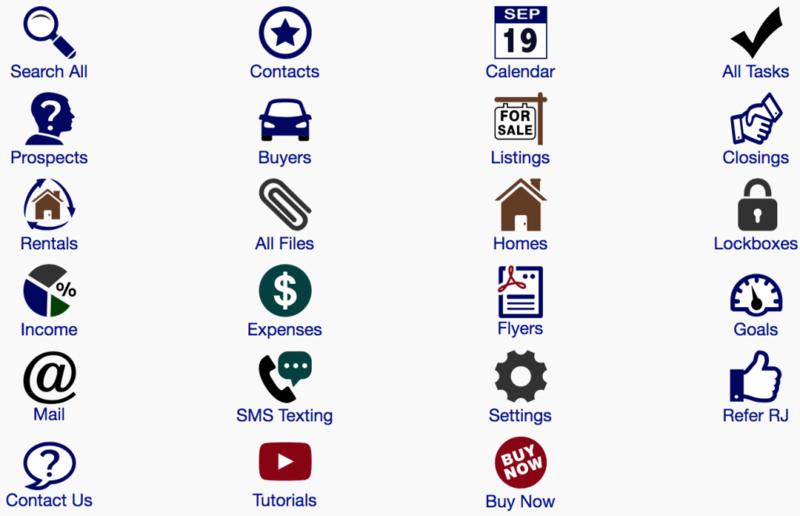 You can then create a RealtyJuggler icon to your phone or tablet so you can access the online platform when you’re out of the office. RealtyJuggler is a real estate agent-specific CRM that lets you organize leads and manage transactions. The platform costs $99 per user, per month and offers a free 90-day trial, making it an excellent option for agents on a budget. Plus, RealtyJuggler lets you integrate with a variety of lead nurturing tools to create a custom CRM experience. Freshsales may not have built-in property planning tools. However, it is one of the best CRMs for small business. It includes a built-in dialer and can be customized to fit the needs of your agency with new integrations coming every day. This makes a great alternative option and one you can try for free by signing up for its forever free Sprout plan or test driving one of its more robust paid plans for free for 30 days.